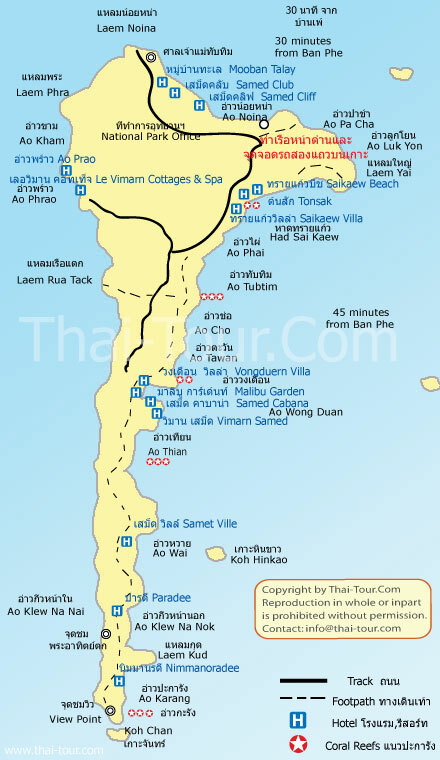 Samet island (or Samed ) (เกาะเสม็ด) is a is part of Khao Laem Ya-Mu Ko Samet National Park (อุทยานแห่งชาติเขาแหลมหญ้า-หมู่เกาะเสม็ด) in Rayong province, approximately 220 km southeast of Bangkok. The island is located about seven kilometers from the main land, in the Gulf of Thailand. Samet is always my first choice when I want to have a short break from busy life in Bangkok because its beaches are among the best in Thailand. It has fabulous beaches and it is not very busy and chaotic with night life, bars and discotheques. 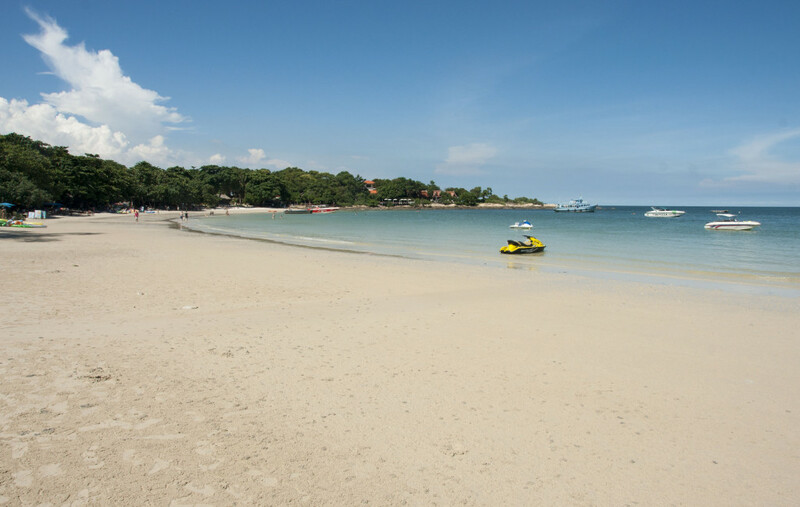 The most well-known beaches on Samet are Hat Sai Kaew (หาดทรายแก้ว) , Ao Phai (อ่าวไผ่), Ao Vong Duan (อ่าววงเดือน), Ao Keiw Na Nok (อ่าวกิ่วหน้านอก), on the East coast, and Ao Prao (อ่าวพร้าว) on the West coast. Many of these beaches has sand that is so fine and white, it almost has a similarity to flour. My favourite beaches is Ao Wong Duan since it is not too busy yet too quiet. It is a 500 meter long half moon shaped beach with the most fantastic sunrise on this island. Another beach I also enjoy is Ao Phai beach (อ่าวไผ่), also known as Ao Pai or Silver Sand. 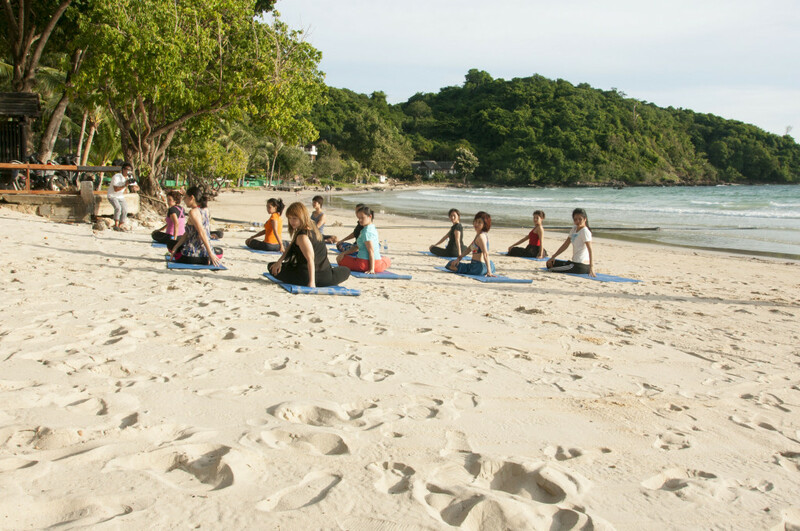 It is a small, 150 metre stretch of white sand immediately south of Sai Kaew Beach (the main beach). The beach provides a cozy impression with all the small rocks and lush green trees in the shoreline, which provides much needed shade. A nightlife, however, more low down, than Sai Kaew beach. The low tables covered by candles and the convenient pillows accurately placed along the beach, right on the sand – ideal spot to enjoy a tropical night. Evening time, there are many beach-front restaurants to enjoy. I usually stay on the East coast of the island, and have never thought of visiting the west side. But one of my many trips to Samet, I decided to explore more of this paradise and I liked it! It felt like I am somewhere else, not the usual Koh Samet I know. There are only three mid to top-end resorts on this side. It is also the best spot to see the most beautiful sunset on the island. If you heard about the oil spilt incident in 2013,the effects of the spill have diminished and tourists have returned to have a vacation here as it was before. 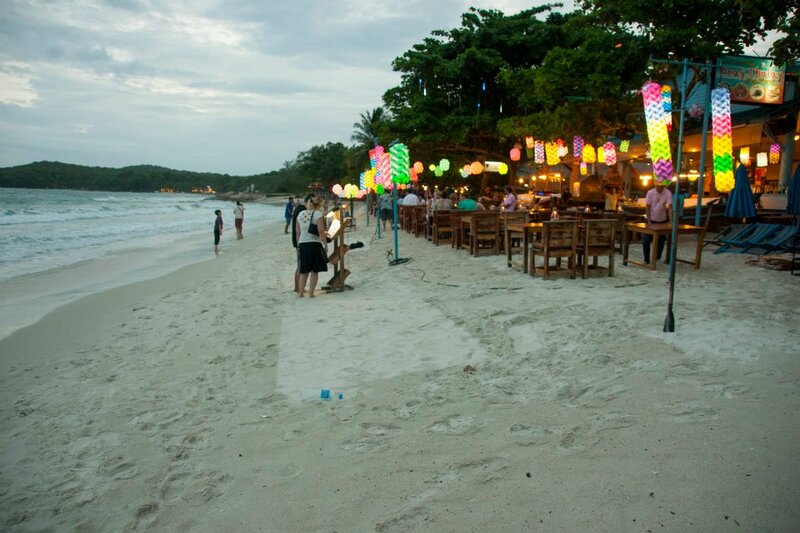 Many times people asked me where in Samet is the best to stay, it is actually depends on what you are looking for? 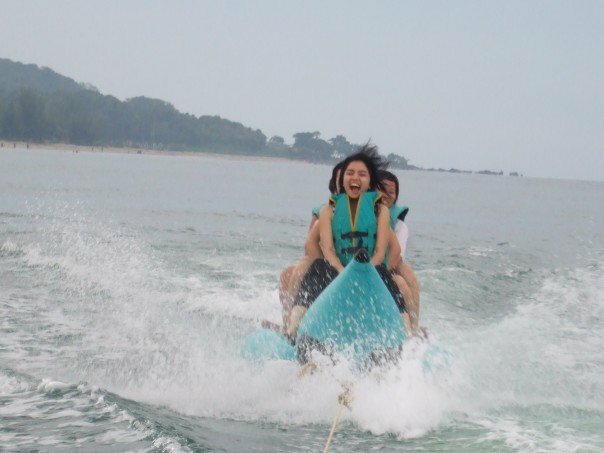 If you like to party, enjoy lots of water sports and big crowds, you would like to stay in Hat Sai Kaew. If you want it very quiet and private, Ao Cho, Ao Wai or Ao Prao is just perfect for you. If money is no object, Ao Kiew Na Nok has a private white sandy beach where the most luxurious resort on the island is located. 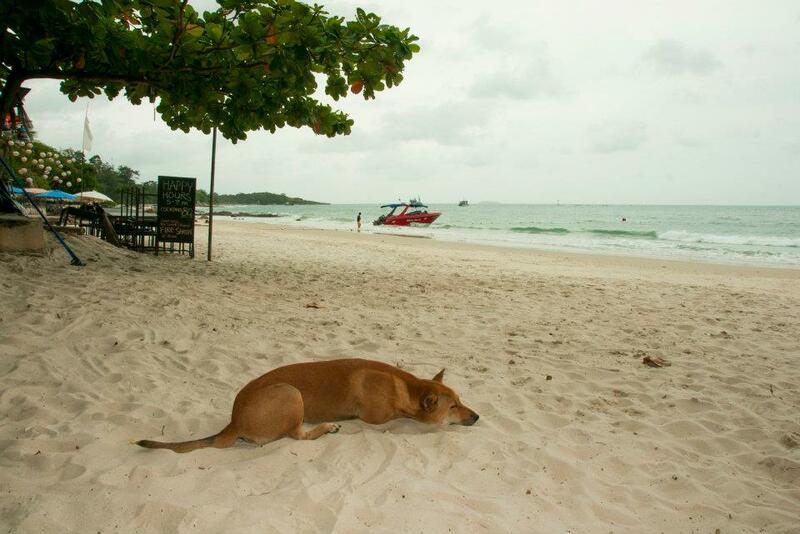 The weather in Koh Samet is normally good all year around. Even during the rainy season, between June and October, people still go to the island because it is not generally raining that much. 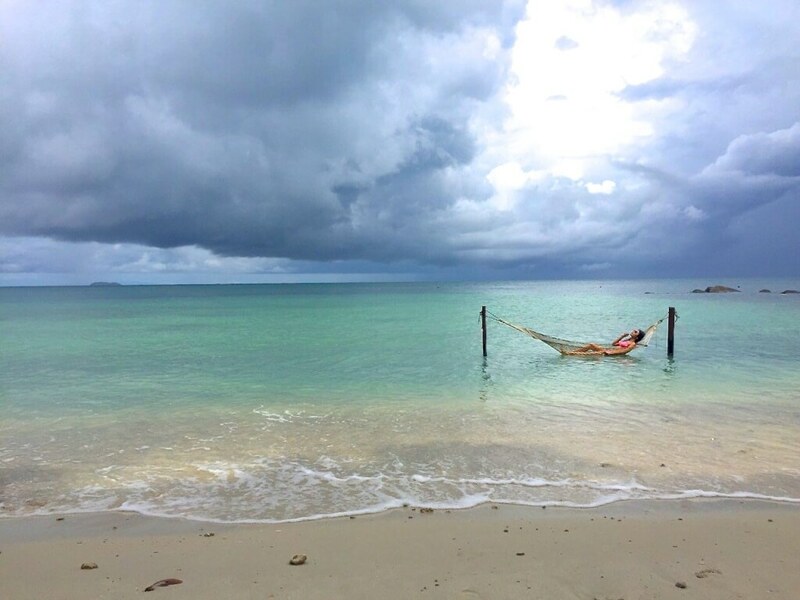 Koh Samet is actually the island in Thailand that has the driest weather during the rainy season. By car The most popular route is Bangna-Trat Road (Highway No.34) via Bang Phli and Bang Bo District (Samut Prakan Province) and Highway No.3 at km. 70. The total distance is 220 km. By air con bus at Ekamai bus station. The bus runs every hour from 5.00 a.m. to 20.30 p.m. from Bangkok to Baan Phe public bus station which located opposite of Nuan Thip Pier. It takes about 4 hours. Look for Cherd Chai Tour which is the popular public bus provider. Be careful! there are buses from Bangkok – Rayong city center, don’t buy the wrong ticket. The island is located about seven kilometers from main land. There are two ferry providers to the island. 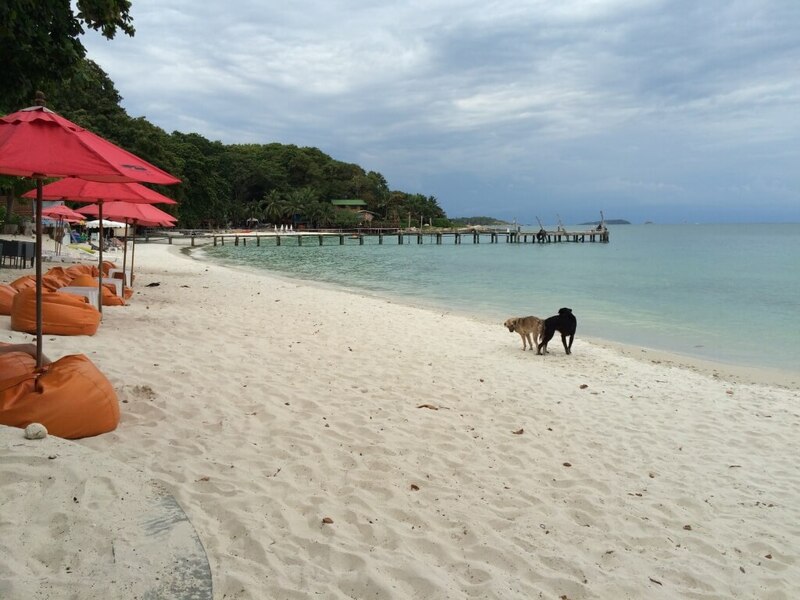 – Nuan Thip Pier: Their furriers service available everyday, and 24 hours a day to Na Dan pier on Samed island. The ferry departs hourly from Mon-Fri, and every 30 minutes on weekends, but after 18:00 p.m. they will wait until they have 20 passengers before the furry will leave. The ticket is 100-200 Baht per person per round-trip, upon your beach destination. It’ll normally arrive at 3 piers on Samet Island. The most popular pier on Koh Samet is locally called “Na Dan” which is approx 25 mins from Baan Phe Pier, Ao Praw (30 mins) & Ao Vong Duen (45 mins). – Sri Ban Phe Pier: It is the new pier. Their ferries run every hour from 8:00 – 18:00. The ferry departs hourly or fully passengers at 20 people. The ticket is 100 Baht/person round-trip. The ticket is open ticket which you can choose any return date. There are six speed boats available for hire (it takes up to 12 passengers). The price starts at 1,200 Baht, it increases follow the distance. They can take you to any beach destination you wish. Entrance fee: When you get on to the Island, there are ‘Songtaews’ (Open-sided Pick Up Trucks) that go into the national park, they always stop at the ranger station and you’ll get charged 200baht for adult, 100 for children entry fee Only 20 baht for Thais. Going around on Samed island: You can rent a motor bike or get on a Songtaew. My fondest memory: Chilling at the beach, reading a book, having a beach massage, and eat a lot of fresh seafood. Oh! that is my heaven on earth! 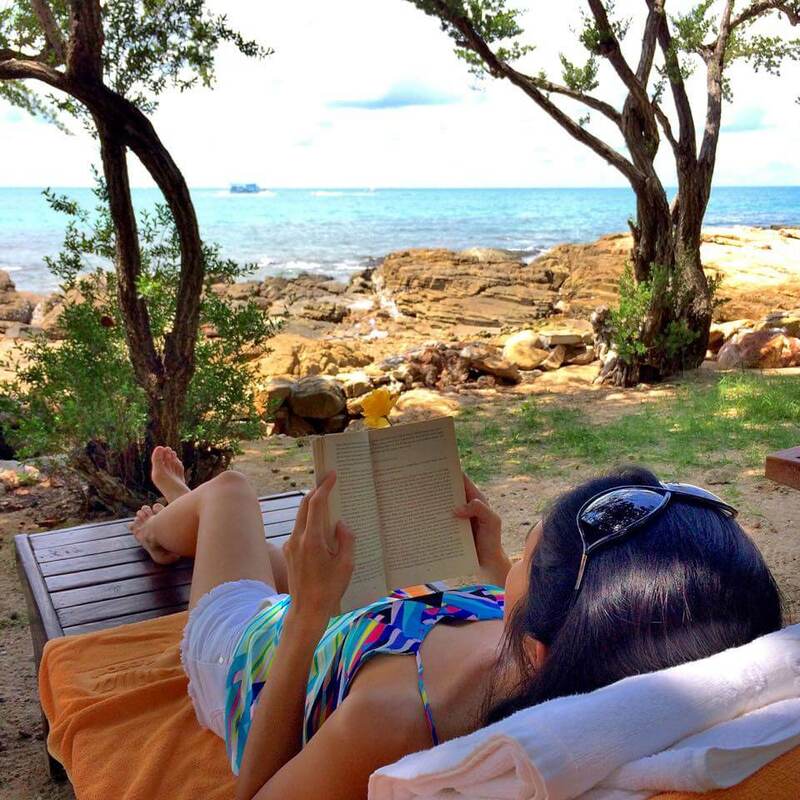 Enjoying my book in a quiet corner on Ao Phai in June 2015. 9th September 2015 : I took teacher Pear to Samet island, it was her first time. We walked from Ao Cho to Ao Wong Duean (only 5 minutes walk) for delicious seafood dinner and watched a fire show. 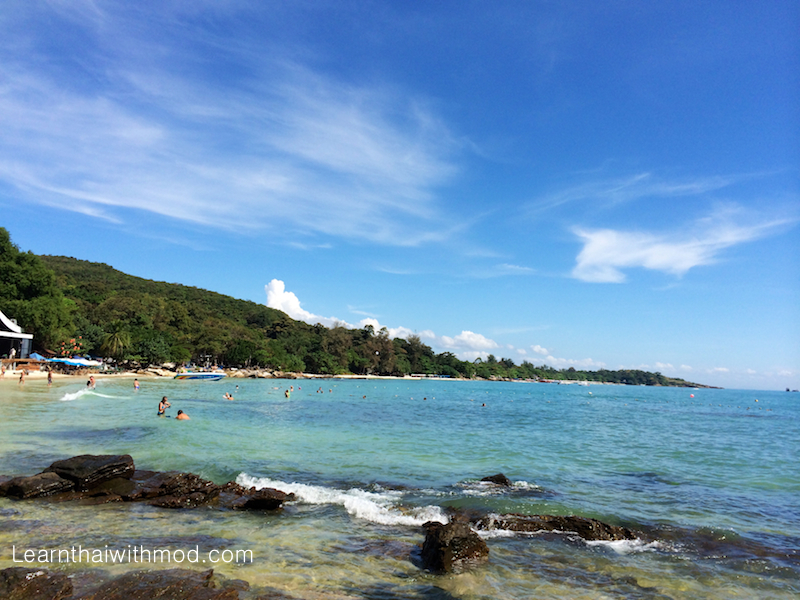 Ao Cho is now one of our favourite beaches on Samet island. I went to Koh Samet Last year (February 2017), from Bangkok in a taxi. Love the stay there. Thank you for sharing your picture, they are beautiful! They make me miss Koh Samet. I enjoed watching your pics from Kho Samet and the video in the hotel. Learned a lot of new Thai phrases. I’d like to spend a holiday in Kho Samet, same place you stayed. Could you give me the name of the resort, please. Want to go there end of June. Been there 3 times and in the first picture I can see the bungalows we use to rent. This is my favorite beach and island and are absolutely going there many more times. Hi, miss Mod… I always wanted to discover Thailand, now that I found your site, there’s no way I can’t be on the places I wanted to be. Thank you! oohhh!… I almost forgot, its been a year since I watched your video’s in youtube, it was great! 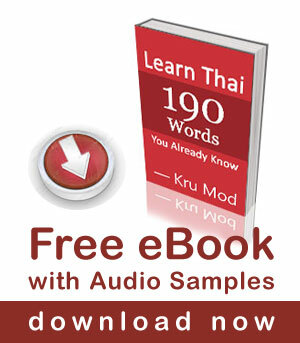 very educational for the foreigner’s who are planning to visit and those who are now in thailand. I stayed at Ao Vong Duan for three days a few years ago. Was very nice once I figured out how to avoid the mosquitoes! How to say ‘henna tattoo’ in Thai language? I will try it someday. Brides does that at the time of marriages, not at back but on hands and legs. Few trendy girls at waist.